Maybe my craziness shows when I say this book seemed like it would be nearly impossible to do well, but I am going to be completely honest. The idea of a fictionalized biography sounds like just about the worst type of book in history. It is hard to make an interesting story that can basically be described like this: "He wanted to be a writer, so after long years of torment and disapproval, he did." (I know that book after book after book follows that same pattern, but work with me here.) And to reduce the great Pablo Neruda to formula like that? Sacrilege, some would say. Fear not, those with a similar mindset: "The Dreamer" is an amazing book. How amazing, you ask? Well, in my review of "Mockingbird" I said I would most likely not be able to find a book that would affect me more strongly and touch me right down to the very core of my emotional being. If "The Dreamer" doesn't top it, it at least matches "Mockingbird" for me. This is, and will remain, without a doubt one of the best books of 2010. This is a book lover's book, through and through. 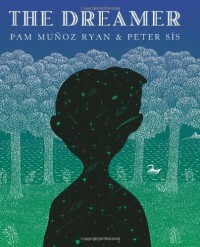 Though I am one of those unfortunate souls who never encountered a book by Pam Munoz Ryan before this one came along, I have no reason to doubt the many, many laudatory things said about it. When I read this book, I was THERE, in that world. Everything was brighter and more acutely observed that I may have noticed in the real world, in real nature. That, my friend, is the sign of a good writer. Also a sign of a good writer: characters that, for better or worse, are distinctive and memorable. What young, book-loving, daydreaming, sensitive child (or teen, or adult) wouldn't be able to relate to young Neftali, even on a basic level? This is a kid who the reader will undoubtedly be rooting for from the very beginning, and not just because his home life is just shy of torture more often than not. The character of the father, a horribly strict and insensitive man, is ferocious and terrifyingly real, if portrayed as one-dimensionally evil at first. I am forever grateful that my parents, whatever their faults, were never any less than totally supporting of my goals in life, and this book cements that idea in my mind. As for the other characters, they're definitely likable and real and all, but the only memorable presence aside from Neftali and the Father, is Uncle Orlando. It is unsurprising that he fueled the young future poet's goal to use words in a way that would make people listen. It is hard to think of an immediate flaw in this book, which I suppose is a good thing but does not suit me for this review. Frankly, the only problem that I can think of is that it may be TOO much of a book lover's book for everyone. If your love of the written word does not rival that of Neftali, you may not be as enamored of it as I was. Still, a book like this one should probably have that as its flaw; Pam Munoz is clearly in love with the written word and it shows on every page. This is, quite simply, an outstanding work of literary art, and it deserves to be read and reread by young and old for many years to come.